With their share prices discounted, now is a great time to follow the legendary investor from Omaha into Apple, Bank of America, and American Express. Over the last half-century, Warren Buffett has delivered a 21% compound annual return to Berkshire Hathaway (NYSE:BRK-A) (NYSE:BRK-B) shareholders, in part by following the simple approach of investing in great companies when they are on sale. Mirroring that strategy might not turn you into a billionaire, but it will help you grow your nest egg, and sleep well at night. After the market's recent slide, it's an opportune time to go shopping, and Berkshire's stock portfolio is a great place to look for ideas. Buffett makes a habit of buying into strong companies during turbulent times in the market; lately, he's been nibbling at shares of Apple (NASDAQ:AAPL) and Bank of America (NYSE:BAC), and Berkshire has long held a stake in American Express (NYSE:AXP). Apple faces a few significant challenges right now, with slowing iPhone unit sales, and slow growth in China, a market that supplied about a fifth of its total revenue over the last year. Despite those issues, Berkshire owns 252 million shares of Apple, worth $37 billion at current market prices. As of the end of the third quarter, Apple was Berkshire Hathaway's largest stock holding. Some of Buffett's greatest investments, such as Coca-Cola, have been consumer goods companies. And even though it's a tech company, Apple seems to fit that mold, given the strong pull its brand has on consumers. Consider that more than 500 million people visit an Apple Store every year, and there are currently more Apple devices active around the world than ever before. The iPhone maker is going through a transition as it maneuvers through a stagnant global smartphone market, but its large installed base of active devices is fueling double-digit percentage growth in non-iPhone revenue, especially from its services and wearables segments. Of course, the last reason Buffett would see Apple as a buy right now is that the stock is downright cheap, trading at a forward P/E ratio of just 10. Check out the latest Bank of America earnings call transcript. Looking over Berkshire's stock holdings, it's obvious that Buffett believes bank stocks are good investments. Berkshire owns large stakes in six different major banks. As of the end of Q3, Berkshire owned 877 million shares of Bank of America, worth $23 billion, making it the second-largest holding in its portfolio. Moreover, the latest 13-F filing with the SEC shows that Berkshire increased its stake in the bank by almost 30% in the quarter, which indicates that Buffett still likes it at current market prices. He has been a big fan of CEO Brian Moynihan. Since Moynihan took over in 2009, Bank of America has emerged as one of the best-managed banks in the industry. Non-interest expense has come down from over $80 billion in 2011 to $54 billion over the last year. The implementation of tight cost controls has fueled a surge in profitability that put Bank of America's return on assets much closer to that of other industry leaders like Wells Fargo and JP Morgan. 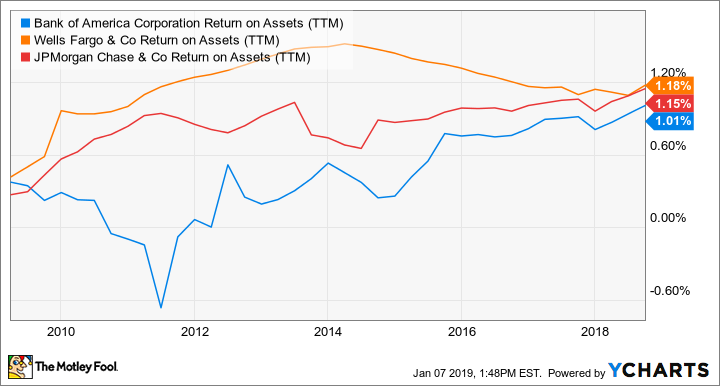 BAC Return on Assets (TTM) data by YCharts. Bank of America serves about half of all U.S. households, and has been making concerted efforts to deepen its relationships with corporate and institutional clients as well. In Q3, the return on average assets reached 1.23%, which is better than the year-ago quarter's 0.95% and shows that management is not done improving profitability. The stock is trading at a forward P/E ratio of 9, and sports a dividend yield of 2.46%. Berkshire has been a stakeholder in American Express for many years: At the end of the last quarter, Berkshire owned 151 million shares worth about $2.3 billion. Amex has a difficult-to-duplicate business model that's rooted in deep customer relationships. It builds customer loyalty by offering premium perks, such as free airport lounge access and special deals at select merchants. Cardholders must pay an annual fee in return for these benefits, but many feel it's worth it. The company provided unrivaled customer service in its industry, and those who travel frequently can recoup the yearly outlay through reimbursements for baggage fees, airline fee credits, and Uber credits, among other benefits. American Express also charges fees to merchants that accept its cards. In return, Amex helps those merchants connect with customers and grow their businesses. Merchants are willing to pay the fees because Amex card members spend more on average than other cardholders, which is a big plus. Right now, you can buy one of the top credit card brands at a forward P/E ratio of just 12. That's very attractive considering Amex has delivered double-digit percentage growth on both the top and bottom lines through the first three quarters of 2018, and analysts expect the company to grow earnings at an annualized rate of 12.5% over the next five years. Apple, Bank of America, and American Express all have enduring qualities that should keep them generating returns for their shareholders for decades. They're also cheap at current prices, and pass Buffett's test as great companies worth owning for a long time.